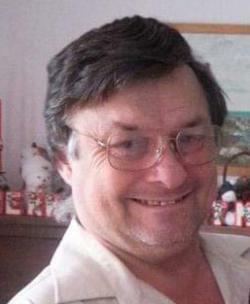 It is with sadness we announce the passing of John William Fear, 64 years, of Pugwash and formerly of Dartmouth, on Sunday, January 13, 2019 in the Cumberland Regional Health Care Centre, Nappan, NS. Born in Springhill, he was a son of the late John L. and Alta J. (Harrison) Fear. John loved fishing and was happiest when he could get away to his favorite fishing spots. He loved his family, especially his two grand daughters, Abigail & Lily. He was a kind hearted man, who had a big smile and kind word for everyone. John will be sadly missed by his son, John Jr (Laura) of Halifax, grandchildren, Abigail Dennis & Lily May Fear; cousin, Bob Harrison and family of Halifax, niece, Christa Maxwell and family of Halifax, nephew, Michael Hillis; brother in law Wayne Hillis and family of Halifax and many more family all across Canada. Besides his parents, he was predeceased by his sister, Heather Roach. Arrangements are under the direction of A.H. Brown Funeral Home, 5 McFarlane St., Springhill, NS (902-597-2361). No visitation by request. A private graveside service will be held at a later date. Should friends desire, memorial contributions may be made to the Canadian Diabetic Association or the Heart & Stroke Foundation. Sharing of memories and condolences may be sent to the family by visiting John's online memorial at www.brownsfuneralhome.com or through the A.H. Brown Funeral Home Facebook Page.